This year, more than 13,000 photographs were submitted to National Geographic’s annual photo contest. These 13 are the very best. 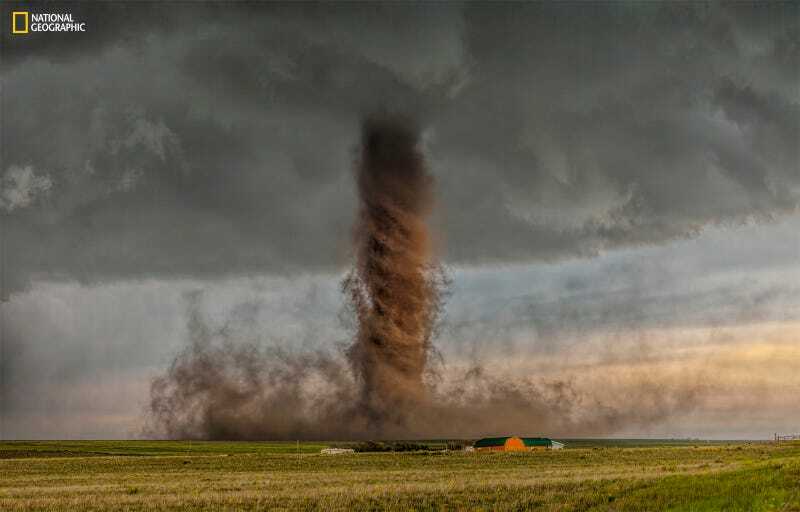 The tornado was slowly getting bigger as it picked up the dust and soil from the ground on the farmland. It wasn’t moving very fast, so we kept getting closer as it tracked next to the home as you can see in the image. Driving down a Colorado dirt road, we were lucky enough to be on the west of the tornado, so it was front lit. This really helped to get great detail out of the image and the perfect light for the sky and foreground. Smart won $10,000 for the photo, and a trip to National Geographic headquarters in Washington, D.C., to participate in the annual National Geographic Photography Seminar next month. Honorable mention in the Nature category was awarded to Andrew Suryono for this glorious image of an orangutan in the rain. I was taking photos of orangutans in Bali, Indonesia, when it started to rain. Just before I put my camera away, I saw this orangutan take a taro leaf and put it on top on his head to protect himself from the rain! I immediately used my DSLR and telephoto lens to preserve this spontaneous magic moment. Alessandra Meniconzi received honorable mention for this photo of Alpine Choughs. The image was taken at Appenzell, Canton d’Appenzell Rhoden-Interieur, Switzerland. Photographer Mohammed Yousef snapped this cool pic of cheetahs. In Maasai Mara National Reserve in Kenya, the cubs of the famous cheetah Malaika learned to hunt. They moved from one hill to another, scanning the lands. Here, they seemed to change shifts as one cheetah left the hill while another took her place. Bence Mate took this photo of white-fronted bee-eaters as they gathered on a branch before going to sleep in their burrows. I was working on this theme for 18 days, as there were only five to ten minutes each day when the light conditions were appropriate. Ninety percent of my efforts to capture this image were not successful. I used flashlights to light the bee-eaters sitting on the branch, but not the others flying above. At this angle, the backlight generated rainbow coloring through the wings of the flying birds. Francisco Mingorance was awarded first place in the Places category for this otherwordly image. While preparing a report on Spain’s Rio Tinto from the air, I decided to include the phosphogypsum ponds located in the marshes of red, whose radioactive discharges has destroyed part of the marsh. As an environmental photojournalist I had to report this story, but had to do it with an image that by itself attracts the viewer’s attention. On a low-flying training flight, this image caught my attention for its resemblance to the impact of an asteroid on its green waters. An honorable mention award in the Places category went to Hideki Mizuta for this striking photo. There are many hundreds of thousands of crosses on the Hill of Crosses near Šiauliai, Lithuania. It represents Lithuanian Catholicism’s peaceful resistance to oppression. Many spirits of the dead are thought to live here on this small hill. When I visited this place, a girl in a pink dress ran through as if she brought peace, hope, and love. This photo, taken by Jackson Hung, was captured during Chinese New Year’s Eve of 2015 in Taiwan. I noticed how the light was coming into the room as our family members passed incense sticks to each other, sending our prayers and paying respects to our ancestors. The photo is symbolic, as the passing of incense sticks represents the knowledge and wisdom passed down from generation to generation. Tugo Cheng earned an honorable mention award in the Places category for this gorgeous image. As the largest system of mountain ranges in Central Asia, Tian Shan—which translates to “sky-mountain” in Chinese—has one of the best collections of natural landscapes in the world and is considered a paradise for outdoor adventures. Thanks to the richness of the land’s sediments, compounded by the power of erosion caused by rivers flowing down the mountains, the north face of Tian Shan is carved into stunning plateaus and colorful canyons hundreds of meters deep, resulting in this surrealist painting in nature. First place in the People category went to Joel Nsadha. Bwengye lives in a slum called Kamwokya in Kampala, Uganda’s capital city. He cherishes his bicycle more than anything and brings it to this playground in the slum every evening, where he watches kids playing soccer. An honorable mention in the People category went to Yanan Li for this dramatic image. In October 2014 in Khuzestan, Iran, I came across a group of female Iranian students on the border between Iran and Iraq. Some of them climbed up the tanks left after the war between the two countries and took pictures of themselves. I pressed the shutter when I saw this girl stretch out her arms and turn to face the Iraqi border. Lars Hübner received honorable mention in the Places category. After a family member passes away in Taiwan’s countryside, their body is kept in the house or in a tent built specifically for this purpose. After a set period of time, the deceased is given a funeral procession before their burial. Simone Monte took this photo at a beach in Rio. Beachgoers kick around soccer balls on Ipanema Beach in Rio de Janeiro, Brazil, the nation that is home to la joga bonita—the beautiful game. Email the author at george@gizmodo.com and follow him at @dvorsky.